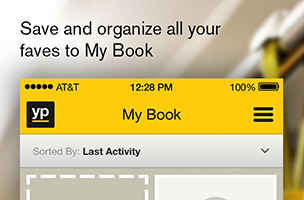 YP (formerly Yellow Pages) has unveiled a new update to its mybook feature on iOS and Android. Using mybook, consumers can organize their favorite local businesses into appropriate categories, with this update introducing the ability to create custom collections of businesses relating to special projects or trips. In addition to sorting businesses into different categories, like food and retail locations, mybook users can create a list of businesses for the perfect day in a new location. For a 24-hour trip to San Francisco, for instance, mybook users could create a list of landmarks, businesses and other attractions, isolating all of the appropriate contact information (business addresses, phone numbers, etc.) to one area of the app for easy future browsing. “We created mybook to give our users a better way to find, save, and organize their favorite local business listings across desktop and mobile,” says Darren Clark, CTO at YP. Mybook supports note-taking for remembering the best items on a restaurant’s menu, or the best salesperson at a store, among other items. Mybook entries can be viewed on a map for easier trip planning, while individual business contacts can be shared with friends and family from within the app. Finally, users can upload their own photos and cover images for businesses, for instant visual reminders and identification of their favorite spots. These new mybook features are now available in the YP app on both iOS and Google Play, which is available to download for free. Check back soon to follow the app on AppData, our tracking platform for mobile and social apps and developers.